One interesting thing that’s come out of the Kake scandal is the warfare that’s breaking out between the Ministry of Education and the Cabinet Office. While Abe and Suga were talking about “phantom documents” (with incriminating references to pressure from Abe on civil servants to benefit his friends), the pictured Kihei Maekawa, ex MOE head, held a news conference to say that such documents definitely existed! Soon other MOE people were raising their hands to say “me too”. The Minister of Education was finally obliged to admit their existence. Abe, with his huge Diet majority, has continued the anti-bureaucracy crusade, this time to better advance his agenda of concentrating power around the Prime Minister, and away from everybody else. In that context, it’s refreshing to see people like Maekawa stand up to him, and condemn the corruption that his absolute power is causing. OK now just a couple of days ago, NHK had a news feature about a group of young civil servants in the Ministry of Economy, Trade and Industry (METI) and their recent white paper about social security. (They’ve got a Facebook page too.) Outspoken, quite critical of government policy, maybe controversial in places… Go bureaucrats! A bit more background on yesterday’s post. Hmm, no blog posts for… how long? Anyway, resolving to improve the situation, and eventually catch up on all the pencil-on-paper backed up “farmlog” reports, here’s a note on the way Abe seems to have the whole Japanese establishment under his Reign of Terror. He hasn’t (yet) tortured or exterminated anyone, although Okinawan protest leader Hiroji Yamashiro was locked up in inhumane conditions for months on trumped-up charges, no, Abe works more subtly than that. Ruling party LDP dietmen owe him their seats and prefer to keep quiet. No faction leaders have spoken up to denounce his more idiotic policy initiatives. The press and media are more interested in company loyalty than doing their job as journalists and the once neutral NHK has become something close to a government mouthpiece (although slightly better since the horrible Momii left as director). Vice education minister Hiroyuki Yoshiie has threatened to take disciplinary action against the whistle-blower who divulged details of a document at the center of a scandal over the planned establishment of a veterinary medicine faculty. The thing is, they aren’t likely to actually fire the guy. If that happened he might well sue them for wrongful dismissal, and whatever way it went, it would stir up all kinds of unwelcome publicity. Easier, just suggest that he might be in trouble. Now whistle-blowers will think twice. That’s what the Secrets Act was for, and the new Conspiracy Law too. They’ll hardly ever have to use these things, just the fear is enough. When I came to Japan the emperor Hirohito was still here, somehow transformed into a harmless marine biologist, but the same warlord who had presided over the Japanese empire of the 1930s and ’40s. It seemed a vaguely amusing curiosity at the time – we Europeans tended not to know so much about what happened in the Asian war, and my impression was “Yes, the Japanese did some bad things, like mistreatment of British and Australian POWs, maybe bombed some cities, but nothing to compare with the evils of Nazi Germany”. It was only fairly recently that I figured I’d better know what the Chinese and Koreans were complaining about, checked out the Wikipedia on Japanese War Crimes and followed up some of the references there. It’s not easy reading let me tell you and I felt thoroughly shaken by some of the content. For example, if you don’t already know about Unit 731 have a look and see if you still feel exactly the same way about this country. Try to imagine the feelings of someone, probably Chinese, whose grandfather or aunt had been murdered there. Bear in mind that Chinese, unlike most Japanese, have been taught all about the atrocities committed in their country by the Japanese, and the anti-Japanese riots of a couple of years ago become a little easier to understand. There may be scope to argue about how many tens of thousands of people died in some incident or other, but there seems no doubt whatsoever that many horrible things were done on a vast scale by the Imperial Japanese Army, mostly under the direct orders of those at the top of the chain of command. The Nanking Massacre never happened. The “comfort women” issue has been blown up out of the kind of prostitution that follows any army. China, Korea and all the countries invaded by Japan welcomed their occupation and benefited from it. The Tokyo trials of war criminals were distorted “victors justice” and an unfair imposition of alien Western values. and… Japan should have nuclear weapons. 1 and 2 are easily dealt with by referring to any historian. No-one seriously doubts those things took place. 3 is a gross insult to those who suffered occupation. Ask an older Chinese, Korean, Filipino, Indonesian… 4 does have an element of truth. The trials were distorted; every effort was made by McArthur to hide the emperor’s involvement in war crimes, and the despicable Ishii, who ran Unit 731, was able to rejoin Japanese society as a respected researcher – because the Americans wanted his data. I used to think that these beliefs were limited to a small fringe element generally rejected by society, and that in another few years we would all be over the war and its aftermath, ready for a new era of peace and co-operation in Asia and in the world. I might have been wrong there too. In the last couple of weeks, several unpleasant creatures have emerged from where they had been hiding and started saying in public what they had long been thinking in private. It started with Katsuto Momii, the new chairman of NHK, Japan’s public broadcaster, who, at his inaugural press conference, compared “comfort women” with brothels in Amsterdam, defended the controversial State Secrets Law and said NHK International should promote government policies. Shortly after, a member of the NHK governors, Naoki Hyakuta, went campaigning for one of the candidates in the Tokyo gubernatorial election, a guy called Toshio Tamogami. If that sounds inappropriate enough, on the stump he said the Nanking Massacre had been made up and added that the three leading candidates (a former prime minister, a former minister of health and a former chairman of the Japan Federation of Bar Associations) were “human trash”. OK, it gets better. It turns out that another newly appointed NHK governor, a lady called Michiko Hasegawa, had written an essay last October about an ultranationalist, Shusuke Nomura. This guy didn’t like something the Asahi newspaper had written about him in 1993, pulled out a couple of guns and shot himself in the stomach three times in their office, dying shortly after. Rather than condemning the illegal use of firearms in an attempt to intimidate the media, Hasegawa said this was a wonderful thing that made the emperor a living god in spite of what it said in the constitution. Pretty weird people on the NHK board of governors, right? Hyakuta and Hasegawa were both appointed by Abe along with two others close to him, and the freshly adjusted board subsequently chose Momii as NHK chairman. More, the surprise in last Sunday’s election for Tokyo governor was not “establishment” candidate Masuzoe winning, as expected, but this weirdo Tamogami who came fourth, but with 600,000 votes. (24% support among voters in their 20’s, tapering off to 6% for over-70’s) Tamogami used to be a Self Defence Force general but he had to resign after writing an essay full of the kind of nonsense referred to above. Tamogami’s essay won a contest run by the Apa company. The English translation is still available from the Apa website, and a fairly careful deconstruction by Tobias Samuel Harris here. 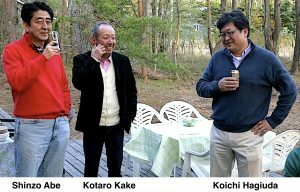 I don’t know if you remember the scandal about apartments and hotels that didn’t meet earthquake standards a few years ago, but the hotels belonged to Apa, whose president Toshio Motoya is another right-winger close to Abe. Abe himself might be a hopeless idealist but many of the people around him are thoroughly unpleasant characters whose prime motivation seems not to be the protection of the Japanese people but how best to exploit them. So it looks as if Abe is trying to put NHK under pressure not to publish content inconvenient for him, and is already succeeding. It took them three days to mention the Momii controversy and I still haven’t heard anything from them about Hyakuta or Hasegawa. The relatively high support for Tamogami among the young suggests the LDP’s proposed editing of school textbooks might not be needed. The young already have no grasp of how outrageous the things Tamogami and co. are saying really are. The english-speaking web is full of articles about Japan’s “swing to the right” at the moment, but I’m adding my small voice to all this because I think it’s important, and very dangerous for Japan. As a friend put it the other day, the country may be “sleepwalking into disaster”. Now it’s true that the rulers of China have been instilling anti-Japanese feeling in their people for years, and this is helping to promote nationalism in Japan, along with genuine fear of the growing Chinese army. In return, the Abe government’s hawkishness is a convenient distraction from China’s many domestic problems. Even so, no good is being served by this attitude on the Japanese, Chinese and to some extent Korean sides. The example of Germany is often held up as a way for Japan to make peace with its neighbours, but I’d like to offer another one: South Africa. The Truth and Reconciliation Commission may not have been perfect, but the attitude of honestly facing up to what happened in the past is surely a necessary foundation for a healthy future relationship? Abe thinks that his years of zen and carrot juice in the wilderness have made him into a Great Leader who will Save Japan. I think he’s an arrogant prick. He’s just so full of himself it’s impossible to watch without wanting to throw up. Japan is a beautiful country with a wonderful culture and sincere, good-hearted people. I like to think that sooner rather than later they will see through the idiotic nonsense he and his cohorts have been peddling and throw him off, as America finally rejected George Bush. I like to think that Japan will return to the sort of sensible path briefly hinted at by the DPJ in their short turn at power. I like to think that Japan could set a good example of how mankind can deal with some of the huge problems on the near horizon. Please, Japan, don’t let me be wrong this time. Just google “japan secret law” or something, to see that the internet is seething with opposition to the Abe cabinet’s new official secrets bill. With the Diet due to finish this year’s session tomorrow Abe & co. were desperate to push the bill through, and it became law tonight. There’s not much I can add to the chorus of outrage, except to point out, if you hadn’t noticed, that opposition to this dangerously flawed bill is as strong here in Japan as among nit-picking foreign human rights organizations. Over 50% of the population are opposed to it and a succession of prominent people have spoken out, from TV personalities, famous film directors to a group of Nobel Prize-winning scientists. (Check the links below to see what all the complaints are about.) So, with a good chance of losing his hitherto high support ratings, why was Abe so determined to push this through? The first strand seems to be defence – the government have just set up a National Security Council-type thing copied from the US, who have been putting some pressure on Japan to tighten up on secrecy if they are going to share anything juicy. After the Snowden revelations everyone’s a bit touchy. This is all about getting closer to the US to resist an increasingly dangerous-looking China, who have done Abe a favour by tightening the pressure over the East China Sea at just the right moment to convince the Japanese public that More Military is needed. Japan has a long post-war history of pacifism, but Abe and his friends have a long history of militaristic nationalism and they seem set to try to undo what was accomplished in the last 60 years. There are more things on their list, like revoking the ban on arms exports so the Japanese arms industry can grow, removing from school textbooks any references to unpleasant episodes like the Nanking massacre or the Comfort Women issue and changing the constitution so as to allow the Japanese army to join in overseas escapades with its US friends. Oh yes, and changing the Japanese Self Defence Force into a “proper army”. But there are people who say the purpose of the official secrets law goes beyond national defence and security. For a start, anything related to fighting “terrorism” is a candidate for suppression, and the LDP government seem to have a broad definition of terrorism. That slimy Ishiba character referred to demonstrators outside the Diet as being little different from terrorists, and the official definition seems to include anyone who tries to change the way things are being done… Journalists are prime targets and so might be anyone campaigning against government policy. If such a group were rounded up and imprisoned, maybe that fact itself might become an official secret? It’s a genuinely frightening prospect, but not out of the question. Other topics that the bureaucrats who will administer this secrecy might like to cover up could be any spillage of radioactive materials from the broken Fukushima reactors. People have even hinted that Abe is eager to get this in place to prevent some of his own shady background from coming out. It’s awful, but this is what Abe is all about, and there’s plenty more where that came from. By the way, have you noticed he hasn’t really done anything to improve the economy yet? It’s all been talk, and the only ones to benefit have been a certain wealthy group in Tokyo. This nationalist agenda is what he really wants to get done. If you’ve read this blog before you may have gathered that I dislike Abe. I think he’s living in a dream world and has the potential to do Japan great harm. This time however he might just have overreached himself. Some people say with three years before he has to face re-election he can afford to sit tight, and people will soon forget it all as they enjoy the benefits of “abenomics”. Others say he might well be headed for a re-run of his last prime ministership in 2006 when he forced unpopular measures through the Diet and ended up resigning in ignominy. You can guess I’m hoping for something like the latter case. Here are some links if you’d like to read more about all this. Abe’s not going to be allowed to forget the promise he made at the IOC meeting that the Fukushima disaster was “under control”. Last week that clip was being shown on TV on a daily basis, along with Tokyo Electric officials admitting that the leakage of radioactive water isn’t under control at all. The word is that if Abe hadn’t pretended that everything was OK the 2020 Olympics wouldn’t have been awarded to Tokyo, but from now on every time yet another cover-up is uncovered, every time the schedule for people to return to their homes is revealed to have been hopelessly over-optimistic, every time a new source of radioactive contamination is discovered, those words are likely to come back to haunt him. Getting the Olympics is being presented as a big boost for Japan, but if you’re cynical it’s possible to view it as another massive transfer of taxpayers’ money to the same old LDP club of construction and real estate companies in the Tokyo area, leaving the rest of the country looking on enviously as yet another Gucci shop opens on the Ginza and visiting foreigners can’t believe all the talk about an economic depression. That tax money is desperately needed for better social services and pensions, for example; a rise in consumption tax has been on the horizon for years and a hike from 5% to 8% is due to come in next spring, going to 10% shortly after. Japan leads the world in the “aging society” trend and because everyone has to pay consumption tax, regardless of income, it’s a way to get money out of the pockets of the wealthy elderly into the economy in general. Of course this hits the pockets of the poverty-stricken elderly – and poverty-stricken youngsters – even more painfully. Yes, even 10% is low by European standards but Japan doesn’t have anything like the social welfare system that those countries enjoy. Previous attempts to raise consumption tax here have been disastrous for the economy, and for the politicians responsible, so Abe ( or his advisors ) is pretty nervous about all this. There’s lots of talk about “softening the blow” for the less well-off but nothing concrete on offer so far. (We might get a handout of ¥10,000.) On the other hand, Japan’s companies – by contrast with us ordinary people – are supposed to be cruelly over-taxed and long due a cut in corporation tax so they can compete with foreign rivals. This is the same sort of reasoning that results in working conditions worldwide being reduced to the level of China or Bangladesh, but if the consumption tax rise is accompanied by a corporation tax cut “to stimulate the economy” it would be easy to see it as a blatant transfer of wealth from the general population to the wealthy capitalists. That’s probably exactly what Abe and his friends would like to do, but would make him politically vulnerable to criticism from opposition parties. So our prime minister looks set to be pretty much tangled up in these practical issues for the foreseeable future: Fukushima, consumption tax, relations with China, the TPP negotiations… We have reason to be grateful, because he has another agenda that has had to be put on the back-burner till all that gets sorted. There’s a strong nationalistic/militaristic stream in the LDP, left over from the immediate post-war years: a legacy of the historic failure of the occupying US administration to root it out when they had a chance. In a short-sighted error, reminiscent of their support of the Taliban in Soviet-ruled Afghanistan, they used the dregs of militarists and yakuza in order to fight communism and the unions. While Japan still has a viable communist party they are a small minority in the Diet, and Japan’s unions are pretty powerless compared with many other countries, so the Americans achieved their object there, but left war criminals in the backrooms of power and universities. I don’t want to blame everything on McArthur’s administration, but anyway we have people like former prime minister Yasuhiro Nakasone whose dream is still to see Japan become a “normal country” with a “proper army” and a constitution to match. In other words, a country that can form alliances and go to war abroad. Abe, while too young to remember the war, for some reason sees himself as the standard-bearer of that tradition. Last time he was prime minister he was talking about “beautiful Japan” just before he was thrown out, so this time he’s keeping his nationalistic opinions more under wraps – for now. So what have we got coming if he ever gets all those problems above “under control”? Well, for a start he’s already filled his cabinet with people of similar views. The Abe view of history is already causing friction with China and Korea, but there are plans to further ingrain it in the minds of Japan’s children with more revision of textbooks. Abe has said he wants children to grow up proud of their country. This is a fine goal, but surely better achieved by working to create the kind of country one would be proud to grow up in, than by telling kids that they’re obliged to be proud. Surely it’s better to be honest about things that have happened, and vow not to let them happen again, than to pretend nothing shameful ever occurred? The Yasukuni shrine in Tokyo, beloved of rightwingers like Abe, apart from its quite legitimate role of honouring Japan’s dead, also has a museum where WW2 is presented as some kind of benevolent action by Japan to free Asian colonies of the West. Yes, there’s plenty to be ashamed of in my country’s colonial record (UK), but ask Indonesians or Singaporeans about the Japanese occupation. Going along with that is a move to increase the military budget. This is justified by the behaviour of China and North Korea, both of whom are indeed giving people who live in Japan reason to feel nervous. Surely it goes without saying , though, that war would be a disaster for all countries involved, for the region and for the world? There seem to be people in both Japan and China who see eventual military conflict as inevitable. Abe is doing nothing at all to make that horrible outcome less likely. The constitution. A lot of attention has gone to the Peace Clause, Article 9 and the LDP’s aim to make it less peaceful. There is great opposition to this in Japan, even in the LDP and it’s Komeito partner, but the LDP has other plans for constitutional changes. Please have a look at that Wikipedia article. There are many changes which suggest a subtle shift back to an authoritarian society in which the public have duties rather than rights.